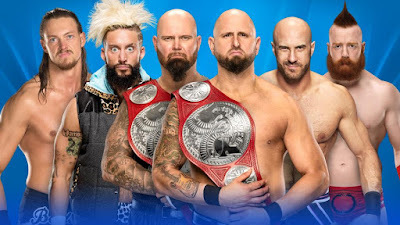 If Luke Gallows & Karl Anderson want to retain their Raw Tag Team Titles at WrestleMania 33, they’re going to have to do so by defeating not one, but two challengers. The bruisers in black will put their coveted championship on the line on The Grandest Stage of Them All Sunday, April 2, live on WWE Network against Enzo Amore & Big Cass and Cesaro & Sheamus in a Triple Threat Tag Team Match. The champions overplayed their hand on the March 13 edition of Raw, when they decided to take out both The Realest Guys in the Room and The Swiss Superman & Celtic Warrior as the duos battled to decide the No. 1 contenders to the Raw Tag Team Championship. As a result, Raw General Manager Mick Foley made a Raw Tag Team Title Triple Threat Match for the highly sought-after titles at The Show of Shows. 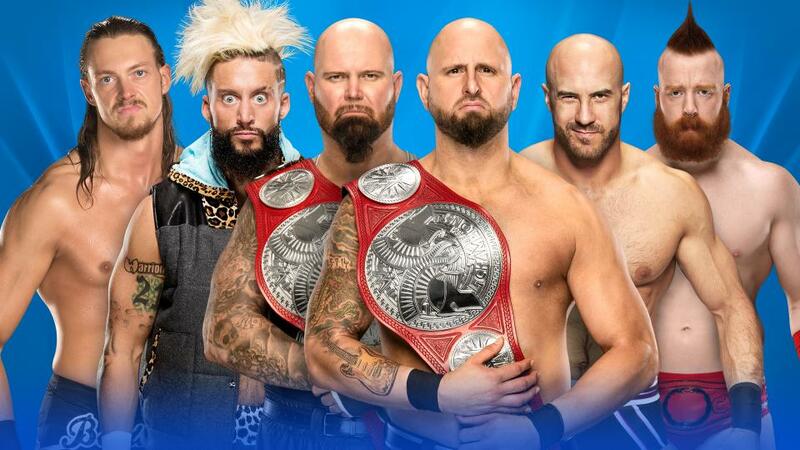 Now, not only will Gallows & Anderson defend their most prized possession, but they will do so against two sets of formidable opponents. At WrestleMania, Neville faces his most formidable challenge since declaring himself King of the Cruiserweights, as he defends the WWE Cruiserweight Championship against Austin Aries. Since making his return at Roadblock: End of the Line, Neville has dominated the Cruiserweight division with a newfound aggression, capturing the championship at Royal Rumble and defeating all comers. Believing no one can compete at his level, Neville has welcomed any and all challengers to his throne. However, one Superstar Neville did not expect to face was former WWE 205 Live color commentator Austin Aries. During an interview on the March 6 edition of Raw, Aries attacked the champion, later revealing that, with his injury healed, he was ready to bring the Cruiserweight division to the “A-Double” level. After defeating Tony Nese and Ariya Daivari in his first two matches back in action, Aries faced former Cruiserweight Champions TJ Perkins and The Brian Kendrick, as well as Akira Tozawa and Nese, in a Fatal 5-Way Elimination Match on WWE 205 Live to determine the No. 1 contender to the WWE Cruiserweight Championship. Emerging victorious and punching his ticket to The Ultimate Thrill Ride, Aries has set his sights on dethroning The King of the Cruiserweights and claiming the WWE Cruiserweight Championship. To Neville, A-Double represents another competitor to be conquered in order for his reign of dominance to continue. How will the next chapter of each Superstar’s comeback story be written? Will Neville’s reign go on, or will Aries bring a new level of competition to the Cruiserweights? Find out at WrestleMania on April 2, live at 7 ET/4 PT on WWE Network. SmackDown Women’s Champion Alexa Bliss is in for the title defense of her life at WrestleMania. 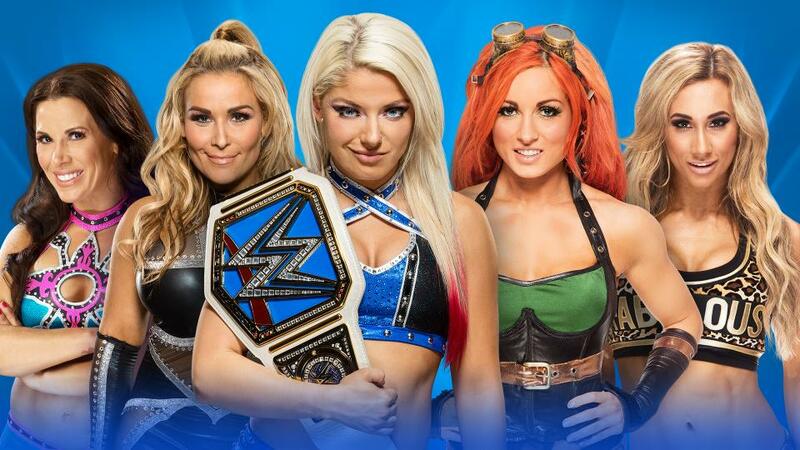 Per the order of General Manager Daniel Bryan, "every available woman on the SmackDown LIVE roster" will have an opportunity to seize Bliss’ title Sunday, April 2, on The Grandest Stage of Them All. In light of the champion’s inability to identify even a single contender she would be willing to face, Bryan’s ruling appears to be the exact opposite of what Alexa had in mind for her WrestleMania dance card. Inaugural SmackDown Women’s Champion Becky Lynch, former Divas Champion Natalya and six-time champion Mickie James have all stated their intentions of enjoying a golden WrestleMania moment. In Lynch, Bliss has a familiar rival; in Natalya, a submission sorceress; and in James, a decorated former ally who is eager to return to the top of the division. Carmella lacks WWE titles on her resume, but The Princess of Staten Island, another challenger, is not short on vicious outbursts, underhanded tactics or James Ellsworth's help, any of which could serve her well in her WrestleMania debut. The pool of potential challengers might not end there, either. Could other female Superstars from SmackDown LIVE, which Bryan calls a "land of opportunity," enter the fray between now and April 2? Even though this isn’t the WrestleMania match she hoped for, the fiery champion won’t fall easily. Bliss’ hair-trigger temper would prompt a charging bull to change course, and with her back against the wall, it’s frightening to think what WWE’s Wicked Witch could resort to. Intercontinental Champion Dean Ambrose’s indestructible nature will be put to the test at the hands of “The Lone Wolf” Baron Corbin at The Ultimate Thrill Ride, WrestleMania 33. The 6-foot-8 biker thug has already done a number on The Lunatic Fringe, whether it was Deep-Sixing him through an electrical board or injuring Ambrose’s ribs by crushing him underneath a forklift. However, the champion is resilient, as well as reckless and unpredictable, as evidenced by his response to the forklift attack: While being transported to a medical facility on the night of the incident, Ambrose reportedly jumped out of the moving vehicle and began trekking back to the arena on foot, in search of retribution. Two weeks later, he rode a forklift back into SmackDown LIVE to officially accept a WrestleMania showdown with Corbin. Both Superstars are used to being the toughest guy in whatever town they roll into, the sort of stock Jim Croce wrote songs about, so it’s no surprise that they’ve run afoul of each other. The hostility only intensified as Ambrose and Corbin kept getting in each other’s way as they both pursued the WWE Championship. 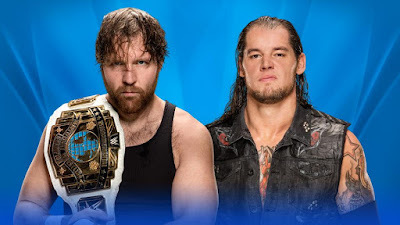 The Lunatic Fringe’s attack mode is perpetual motion, but it remains to be seen whether his famously high threshold for pain will be enough to endure battle with Corbin. Perhaps the heavy-hitting Lone Wolf will be the Superstar to finally shut down the unbreakable champion. It’s equally possible that Ambrose is most dangerous when he’s hurt and angry. Focused on survival and retaliation, his darkest instincts kick in, releasing whatever reins keep this freewheeling force tethered to decency on a day-to-day basis. WrestleMania’s Intercontinental Championship Match will be a brawl. Watch The Ultimate Thrill Ride, WrestleMania 33, live on the award-winning WWE Network Sunday, April 2, at a special start time of 7 ET/4 PT. We’re a culture obsessed with power couples: Jay-Z & Beyoncé, J-Lo & A-Rod, JT & Jessica Biel. So, when John Cena & Nikki Bella square off against The Miz & Maryse at WrestleMania 33, we will not only be seeing two couples of this variety collide, but also witnessing a knockdown, drag-out, awesome (no pun) melee with a ton of personal pride on the line for both sides, as they attempt to find out who SmackDown LIVE’s “it” couple truly is. For years, Cena & Nikki did not acknowledge their relationship within WWE arenas. Total Divas or Total Bellas was one thing, SmackDown LIVE was another. However, after two-time Divas Champion Maryse brutally assaulted Nikki with a lead pipe, and Miz and Cena eliminated each other from the WWE Championship No. 1 Contender’s Battle Royal, the rules suddenly changed. With these two conflicts merging, all four Superstars began to rip one another to shreds on the microphone. The Cenation Leader was a guest on “Miz TV” — the perfect time and place to badmouth The A-Lister. Miz followed with an appearance on Talking Smack, which proved to be an excellent opportunity for him to tell the WWE Universe why he believed Cena is a “robot” whose relationship is manufactured for the benefit of reality TV cameras. Fearless Nikki told Maryse to keep her hands off her man; Maryse retorted by calling Nikki Bella a fraud. In between the smack-talk and these tumultuous physical exchanges, a massive WrestleMania match has been made. Can Cena & Nikki shut up Miz & Maryse once and for all? Or, will The Miz repeat his performance from WrestleMania XXVII, where he retained the WWE Championship over Cena, and push him and his bride to victory? From best friends to bitter enemies, Chris Jericho and Kevin Owens will unleash their anger against each other at WrestleMania, with Jericho’s U.S. Title on the line. Both Superstars enter the championship grudge match fueled by rage, with recent acts of betrayal and retribution fresh in their minds. Jericho spent months protecting The Prizefighter’s Universal Championship reign, only for Owens to torch their friendship on the Feb. 13 edition of Raw. Owens savagely smashed Jericho’s head through a TV monitor and powerbombed him onto the ring apron, resulting in a slew of injuries for Jericho. The keeper of The List of Jericho then repaid KO’s cruelty at WWE Fastlane, distracting Owens and costing him the one possession that he cherished above all else, the Universal Title. Owens has since vowed to make Jericho suffer for his intrusion, promising to take the prestigious United States Championship in the process. With that, the foundation is set for a malicious battle at The Ultimate Thrill Ride, WrestleMania 33. Featuring a dangerous mix of bruised egos and bad intentions, it remains to be seen just how far the once-inseparable pals will go to get the last word. Bayley’s run as Raw Women’s Champion has been a dream come true, but she’ll have to deny her best friend, her most ardent foe and an unstoppable force at WrestleMania to prevent a rude awakening. The beloved Raw Women’s Champion will defend her title against Sasha Banks, Charlotte Flair, and Nia Jax in a Fatal 4-Way Match at WrestleMania 33 that began to take shape as far back as December. That’s when Charlotte wrestled the title from Banks in a grueling WWE Iron Man Match, sending The Boss into a minor tailspin while Bayley rose up as The Queen’s most prominent foe in the process. Even though Charlotte fended Bayley off at the Royal Rumble, a recovered Banks provided her friend with a decisive assist on Raw to dethrone The Queen — and then another at WWE Fastlane, snapping Charlotte’s pay-per-view streak and all but assuring Bayley will walk into her first Showcase of the Immortals as Raw Women’s Champion. Thanks to Raw Commissioner Stephanie McMahon coming down on Charlotte’s side that Sasha’s interference cost Flair the Fastlane match, The Queen was able to wheel and deal her way to the big dance. Banks joined the field at the end of an impromptu friendly against Bayley that booked her passage to Orlando, and Jax followed suit two weeks later by defeating Bayley in a non-title contest to earn her place in the match.